Civilians Still Trapped In Eastern Ghouta, As Fighting Disrupts Aid Delivery : The Two-Way The first aid convoy in weeks reached the besieged neighborhood on Monday — but had to turn back early. A U.N. official says the plight of besieged civilians is one of the worst crises he's ever seen. A wounded Syrian boy receives treatment at a makeshift hospital following attacks on the rebel-held town of Hamouria, in the besieged Eastern Ghouta region on the outskirts of the capital Damascus, on Monday. The situation in besieged eastern Ghouta is dire and deteriorating. The Syrian rebel-controlled Damascus suburb has been cut off from the world by the Assad regime and Russia. On Monday, civilians there finally received an aid convoy — a delivery that was overdue, inadequate, stripped by the Syrian regime of most medical supplies and cut short by ongoing hostilities. Now the United Nations and nonprofit organizations say the partial aid delivery only highlights the desperate conditions in eastern Ghouta. Calls for a cease-fire have failed utterly, civilian casualties continue to mount, and food and medical supplies are scarce as some 400,000 people are trapped in a war zone. Ramesh Rajasingham, the UN's deputy coordinator for the humanitarian crisis in Syria, tells NPR's Ruth Sherlock the situation in Syria as a whole is "a disaster in every single aspect," and that the siege of eastern Ghouta is "probably one of the worst crises that I have seen." "The suffering, it's tremendous," he said, in an interview that will air on Wednesday morning. "You have a horrific human impact of the bombing ... hundreds of civilians killed in the last 10 days, thousands injured. But not only are they injured, but the hospital that they would have gone to in normal times to be treated ... has also been bombed, or has run out of anesthesia, or their doctors have been killed." Pawel Krzysiek, head of communications for the International Committee of the Red Cross in Syria, posted a video after the aid convoy returned, detailing what he and the other team members witnessed. A must-watch. @PKrzysiekICRC describes what our team saw yesterday in #EasternGhouta. "Mothers were telling me that their children did not see the daylight for 15 days. The school has stopped. The people sit with multiple families, with thousands of families in basement shelters," he said. "They are afraid to eat in front of each other because in these shelters when you stay for so long everyone is hungry — even if you have a little food you are afraid to show it. "So they go out to look for some food, or maybe to eat in their homes, and then the fighting starts, the air strikes and shelling starts, and many of them, they die," he said. 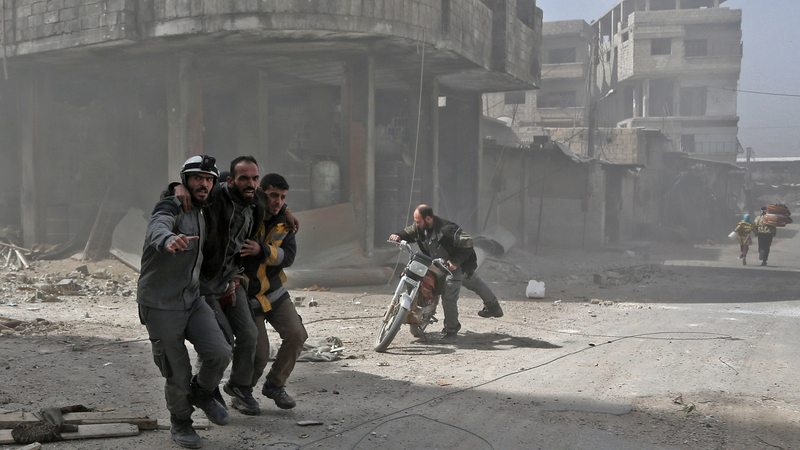 Volunteers from the Syrian Civil Defense help a man in Hamouria during shelling on rebel-held areas in eastern Ghouta on Tuesday. Heavy air strikes and clashes shook the Syrian rebel enclave as France and Britain called for an emergency U.N. Security Council meeting on the escalating violence. NPR reported yesterday that attacks on eastern Ghouta continued even as a 46-truck interagency aid convoy made its way into eastern Ghouta. The convoy carried food for just 27,500 people — a fraction of the trapped population — and most of the trauma kits, insulin and other basic medical supplies were blocked by the government of Bashar Assad and prevented from entering the region. To make matters worse, some of the trucks turned back without ever unloading their supplies. Aid groups participating in the convoy tell The Associated Press that the trip was cut short by active shelling, and ten trucks were never unloaded and another four trucks were only partially unloaded. "After nearly nine hours inside, the decision was made to leave for security reasons and to avoid jeopardizing the safety of humanitarian teams on the ground," Jens Laerke, deputy spokesman for the U.N.'s Office for the Coordination of Humanitarian Affairs, tells the AP. "The violence called into question future aid deliveries," the wire service notes. "Another aid convoy is scheduled to enter eastern Ghouta on Thursday, but Laerke said security measures must be guaranteed for this to happen." More than a week ago, the U.N. Security Council called for a 30-day cease-fire across Syria. That resolution has been "wildly ignored," Ruth Sherlock reports from the border between Turkey and Syria. In eastern Ghouta, relentless airstrikes and shelling continue. The Assad regime, backed by Russia, claims that it is only targeting "members of banned terrorist groups who are unprotected by the truce," as Reuters puts it. There are a small number of al-Qaida-allied rebels in the region, and rebel forces use eastern Ghouta to launch attacks on Damascus, albeit with far less firepower than the regime deploys. The regime and Russia deny targeting civilians, despite accounts of attacks on hospitals and evidence of women and children as casualties. Hundreds of civilians have died in eastern Ghouta in recent days, according to tallies from multiple sources, including the London-based Observatory for Human Rights, the hospital support charity the Syrian American Medical Society and the international aid group UOSSM. Estimates for the death toll on Monday alone range from 79 to 94. The Security Council will meet again on Wednesday, at the request of France and Britain,"to discuss the failure to implement its Feb. 24 resolution," the AP writes. Russian forces have called for a "humanitarian corridor," offering a brief cease-fire in the middle of each day to allow aid to enter eastern Ghouta and civilians to leave. But aid groups report that shelling continued even when they were supposed to have safe passage. Even if perfectly implemented, a partial cease-fire like that would be inadequate, the U.N.'s Rajasingham told Ruth. A limited pause in the fighting "really doesn't help us address the big problem, which is supporting a population of hundreds of thousands who have been besieged," he said. Rajasingham believes there's no long-term military solution, and a political solution is require. The Red Cross' Krzysiek also emphasized that aid deliveries can only go so far. People in eastern Ghouta "are tired, they are angry," he said. "They don't want aid; what they want is the shelling to stop. "And that's the biggest problem of this convoy — what we have done was to bring very little for people to survive for a very short period of time. What they really need is a sustainable solution to their security situation." The fighting in eastern Ghouta shows no sign of abating. "The Syrian government and its ally Russia is pummeling the area with airstrikes and shelling attacks, as it makes a concerted effort to take back control of these towns and villages near Damascus," Ruth reports. There have also been reports that the Assad regime has recently used chemical weapons in eastern Ghouta. 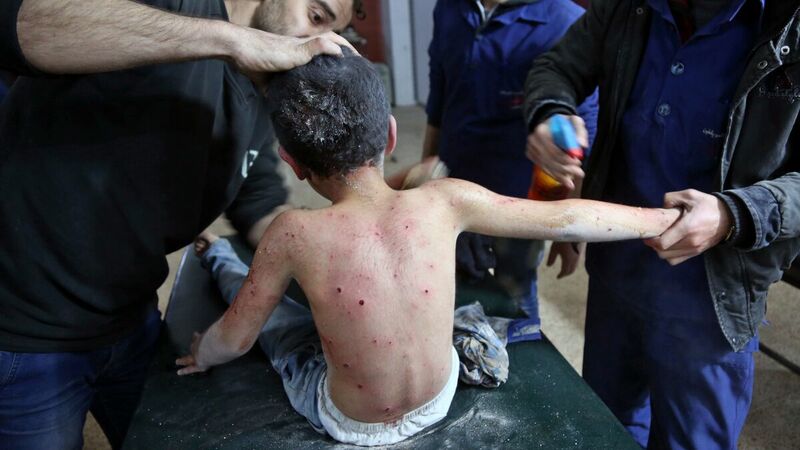 The regime has repeatedly been accused of using chemical weapons against civilians. Is It Possible The Syrian Rebels (Not Assad) Used Chemical Weapons? UOSSM, the Union of Medical Care and Relief Organizations, said victims in eastern Ghouta reported an attack on Monday that left victims coughing and red-eyed; there were no fatalities, but the symptoms were consistent with chlorine gas, the group said. The Syrian Civil Defense, also known as the White Helmets, said the regime was using "poison gas." "The reports could not be independently confirmed," the AP notes, "and Russia used its Security Council veto to freeze the work of a U.N. body investigating such reports earlier this year." Syria, through state media outlets, denies that it is using chemical weapons in eastern Ghouta. Meanwhile, the Russian defense ministry now says it is offering safe passage out of eastern Ghouta for armed fighters as well as civilians. "The ministry says its negotiators in Syria late on Monday called on all rebels leaders in eastern Ghouta to allow civilians leave the area," the AP says. "It says the rebels are also free to leave the enclave with their weapons and families unhindered." Russia and Syria have claimed that rebels are holding civilians captive in eastern Ghouta to serve as human shields, while rebel groups say civilians fear conscription or arrest if they enter regime territory. "The offensive appears to have followed the tactics Assad and his allies have used at other key points in the war: laying siege to rebel-held areas, subjecting them to bombardment, launching a ground assault and offering passage out to civilians who flee and fighters who withdraw. "Wael Alwan, the spokesman for one of the main rebel groups in eastern Ghouta, Failaq al-Rahman, said Russia was "insisting on military escalation and imposing forced displacement" on the people of eastern Ghouta, which he called 'a crime'. "Alwan, who is based in Istanbul, also told Reuters there had been no contact with Russia about the [safe passage] proposal. "The Syrian army has captured more than a third of the enclave in recent days, threatening to slice it in two."